Lenard’s new Tender Gold range is going to change your view of fresh chicken forever. 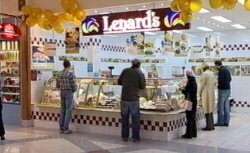 Lennard’s promise you the best fresh chicken ever day throughout their 186 stores Australia wide. At Lenard’s you can choose from a huge variety of healthy, fresh and tasty pre-prepared foods and enjoy marvellous meals in your home. Hard, dry or rubbery chicken need never pass your lips again thanks to Lenard’s Tender Gold chicken breast. The Tender Gold chicken breast is indestructible; no matter how bad you are in the kitchen your cant ruin it. Lenard’s guarantee that even if you cremate it on the barbie or incinerate it in the oven, it will still be golden and tender. Lenard’s also have a great new range of Tender Gold shashliks that come in two new flavours, Sun Dried Tomato and Herb and Garlic, and while your checking that out take a look at the delicious risotto bases. These take the guesswork out notoriously hard risottos.